Situated in Midtown West at 322 West 57th Street, The Sheffield is a post-war condominium that has been renovated to a new level of sophistication. Featuring exotic Nordic ash floors and state-of-the-art appliances as well as gracious amenities like a rooftop pool and a yoga/pilates studio, The Sheffield is a model Manhattan condominium. With a LEED Silver certification on the horizon, the Brompton brings residents an ideal fusion of environmentalism and aesthetic appeal. State-of-the-art appliances and spa-like bathrooms make individual units a luxurious living experience, while 24-hour concierge and doorman services ensure residents’ safety. Given its proximity to the city’s subway lines and a location in the heart of one of Manhattan's most popular neighborhoods, the luxurious residences being offered at 93 Worth Street in Tribeca are certain to give you your money’s “worth”. From noted developers Extell, One Riverside Park features 219 luxury apartments that offer views of the Hudson River and the iconic Manhattan skyline. Located in the Financial District, 50 West St. is a 63-story residential tower designed by Helmut Jahn. The Mondrian is as bright and beautiful as the works of the modernist painter it was named for. This 43-story building stands out in its Sutton Place neighborhood thanks to its striking exterior, but it's many luxury amenities make it the perfect fit for this coveted area of Manhattan. Looking to pair the excitement of the city with the tranquil beauty of waterfront views? Look no further than One Manhattan Square. This beautiful building is located right on the edge of New York harbor on the Lower East Side and provides gorgeous skyline and river views. The interiors were designed by Meyer Davis, an iconic studio behind many famous world-class hotels. The apartments feature kitchens with custom cabinetry, Miele premium appliances, and the choice of a light or dark color scheme. The oversized windows flood the living room with light and provide the stunning views. 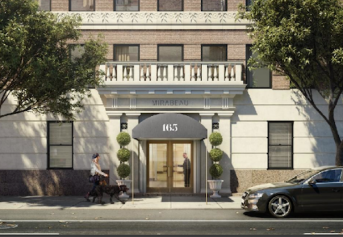 The Upper West Side is a beautiful, historically significant area and as more new developments join the neighborhood, many architects are making the effort to conserve the classic facades and styles of the original UWS buildings.